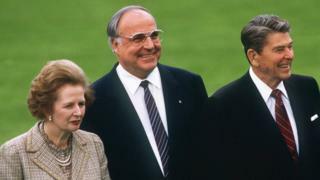 Helmut Kohl, Germany's ex-chancellor and architect of reunification in 1990, has died at 87. Kohl led Germany for 16 years (from 1982 to 1998). He is credited with bringing East and West Germany together after the fall of the Berlin Wall. Together with his French ally President Francois Mitterrand, he was responsible for the introduction of the euro. German Chancellor Angela Merkel, Kohl's former protegee who later called for his resignation over a political funding scandal, said his death filled her with deep sadness. "Helmut Kohl's efforts brought about the two greatest achievements in German politics of recent decades - German reunification and European unity," she said. "Helmut Kohl understood that the two things were inseparable." For his part, Mr Juncker said in a tweet: "Helmut's death hurts me deeply." "My mentor, my friend, the very essence of Europe, he will be greatly, greatly missed," he added. Former US President George HW Bush paid tribute to the man he knew while in office from 1989 to 1993 as a "true friend of freedom" and "one of the greatest leaders in post-war Europe". Kohl suffered a bad fall in 2008 and had been using a wheelchair. He died at his house in Ludwigshafen, in the western state of Rhineland-Palatinate, Bild newspaper reports. Kohl, who led the centre-right Christian Democrats, was the longest-serving chancellor of the 20th Century. A passionate believer in European integration, he persuaded Germans to give up their cherished deutschmark in favour of the European single currency. In the UK, he is remembered for his differences over the EU with the late UK Prime Minister Margaret Thatcher. In France, he is the German leader who held hands with Mitterrand at a service at the Verdun war memorial in 1984 to mark the 70th anniversary of World War One. But for Germans he is above all the man who reunified a country divided by the allied powers after World War Two, promising the people of the ex-communist East "flourishing landscapes", in unity with the richer West. Helmut Josef Michael Kohl was born on 3 April 1930 into a conservative, Catholic family. His political outlook was shaped by his experiences in his hometown of Ludwigshafen in the Rhineland during World War Two. Because of its huge chemical works, the town was heavily bombed and, at the age of 12, the young Helmut found himself helping to recover the charred bodies of his neighbours from the rubble. What he once described as "the blessing of a late birth" freed him from any taints of Nazism. Kohl fell from grace when a funding scandal under his leadership of the Christian Democrats came to light after he left office in 1998. Chancellor Merkel first entered government under Kohl's rule in 1991. But she publicly denounced him and called for his resignation when it was revealed the party had received millions of dollars worth of illegal donations using secret bank accounts. In 2011, in a series of interviews and statements, he spoke out against Mrs Merkel's policy of strict austerity to deal with the European debt crisis. Kohl's later life was also marked by personal tragedy. His wife, Hannelore, killed herself in July 2001 after suffering from a rare skin condition and depression.